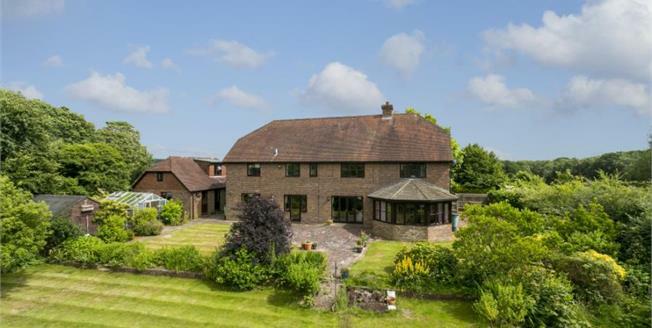 A fantastic opportunity to acquire a spacious 5 bedroom detached house with annexe situated on a quiet country lane in the much sought after village of Rushlake Green. Bramble Cottage enjoys 360 views of rolling countryside and offers generous space and a versatile arrangement suitable for multi generational living. The ground floor consists of a welcoming hallway with gallery landing, an exceptionally spacious open plan kitchen/diner, utility/boot room, separate dining/family room, large lounge leading to a tiled-roof sun room overlooking the garden. Upstairs there are five spacious bedrooms, three of which have en-suite bathrooms in addition to the generous family bathroom. The master bedroom also benefits from a walk-in wardrobe. The property is currently set up for disabled functionality, including a lift, wheelchair friendly access, hoists and treatment/therapy room (items can be included or removed subject to negotiation) In addition, the plot also includes a detached self-contained one bedroom annexe providing useful accommodation for a relative, au-pair or carer. There is ample parking to the front, brick paved terraces to the side and rear with the rear garden also enjoying an ornamental fish pond, greenhouse and storage shed, backing onto the paddocks totalling approximately three acres (tbv) which enjoy their own vehicular access to the side of the garden. There is huge scope to add stabling if required (subject to obtaining the necessary planning consents). Nestled down a quiet country lane the location is simply idyllic. The village of Rushlake Green is a mile and half distant, with local pub/restaurant and village store, it also has many footpaths, country lanes and bridle paths for those with rambling or equestrian interests. The market town of Heathfield is about 3.5 miles northwest and has a comprehensive range of amenities including banks, coffee shops, various supermarkets and eateries. Stonegate station (London Bridge/Charing Cross) is about 8 miles whilst the Spa town of Royal Tunbridge Wells and the coastal resort of Eastbourne are within 16 & 14 miles respectively, both offering an excellent range of schools, recreational facilities and additional transport links to London.